This past week I went to my local farmer's market, there are two weekly markets in my neighborhood and this was my first time at the larger one. I was so glad I went, it was a little bit farther to walk, but it was so worth it! The market was pretty big and the selection was fantastic! I took a back pack and I still had to lug a few plastic bags home by hand because I bought so much. 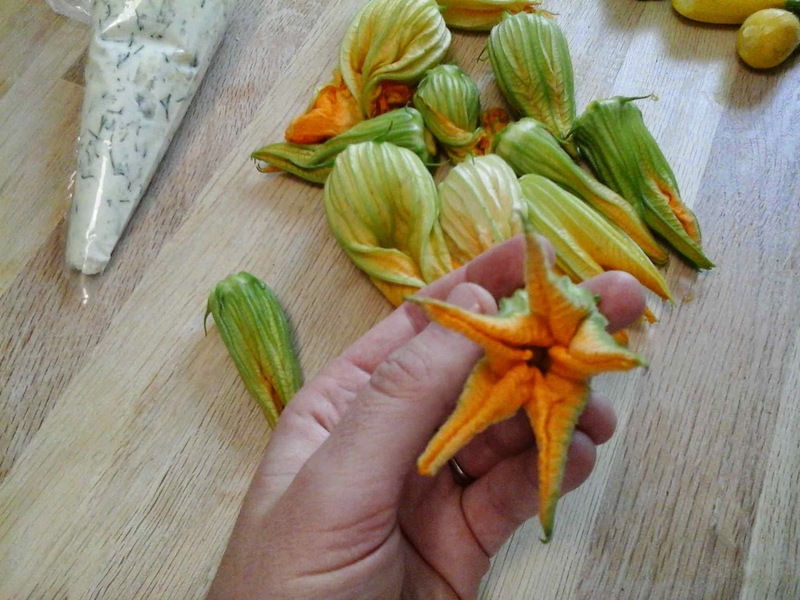 At the market I happened to see some zucchini flowers. 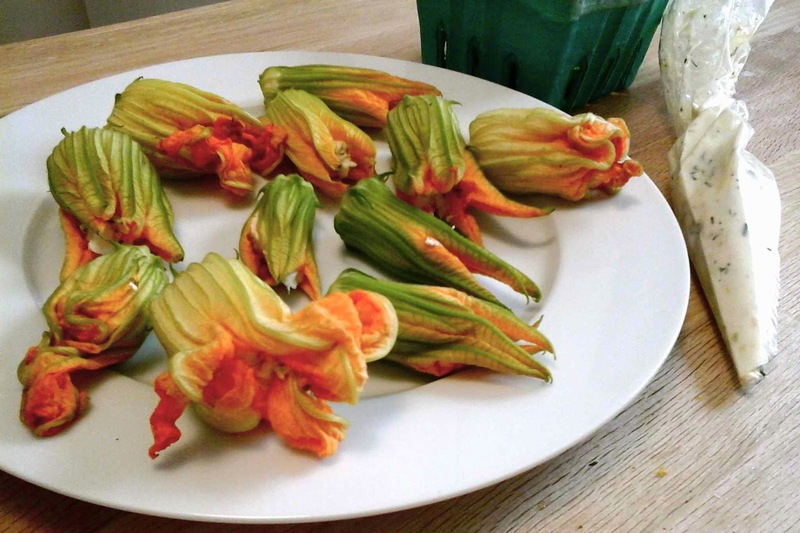 They're these long funny green and orange flowers that grow on the zucchinis, and you can only get them for a little while during the summer harvest. I had never bought any before, but I thought, why not? I had a sort of vague idea that you could deep fry (!) them and since Chris was at work, I thought it would be fun to surprise him with one of his favourite things, McDonalds. Just kidding. 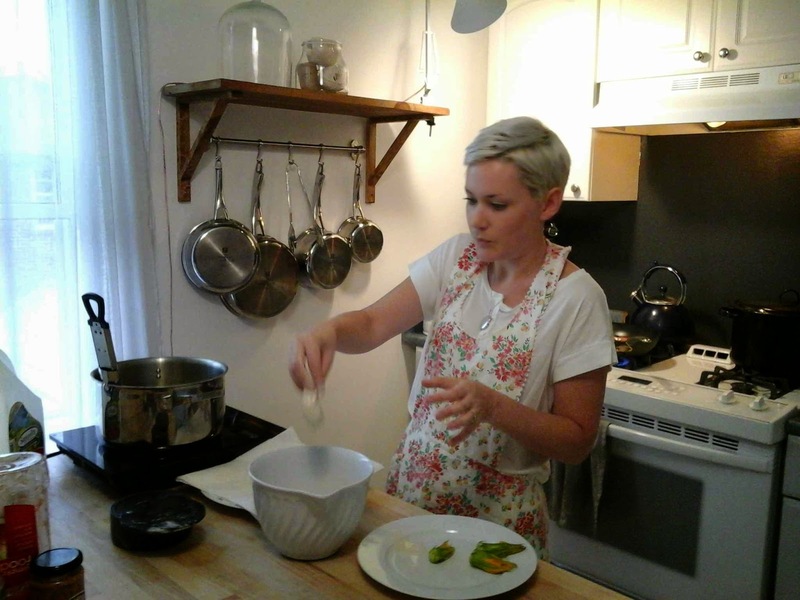 Once I got the flowers home, I came up with an easy recipe based mostly on what we had in our fridge at the time. 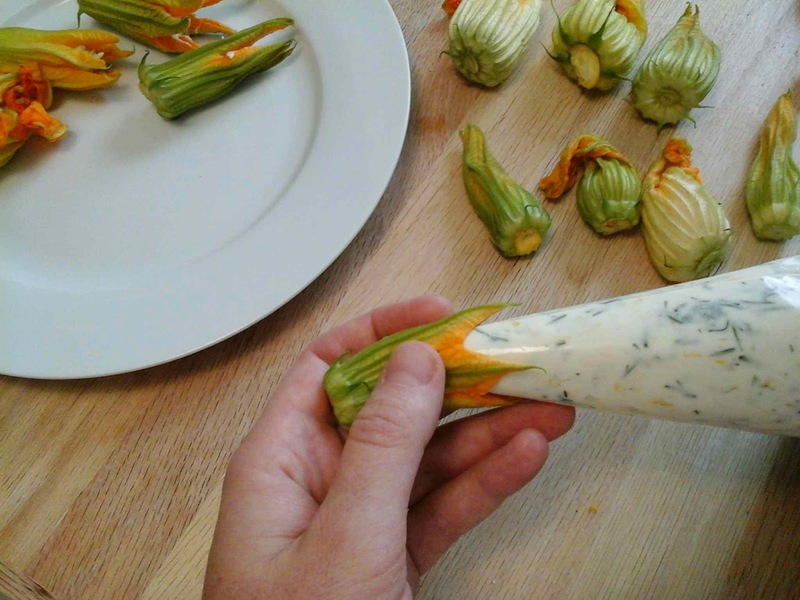 I stuffed the flowers with a blend of cheese and then got ready to show off my deep fry skills! 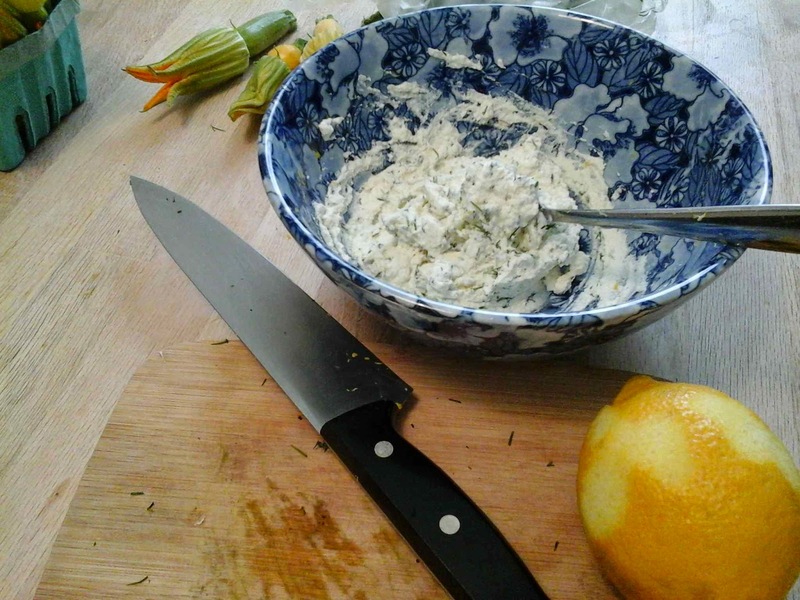 Blend the cheese the zest of a lemon and one or two spoonfuls of chopped herbs. Get ready to make lots of dirty jokes. 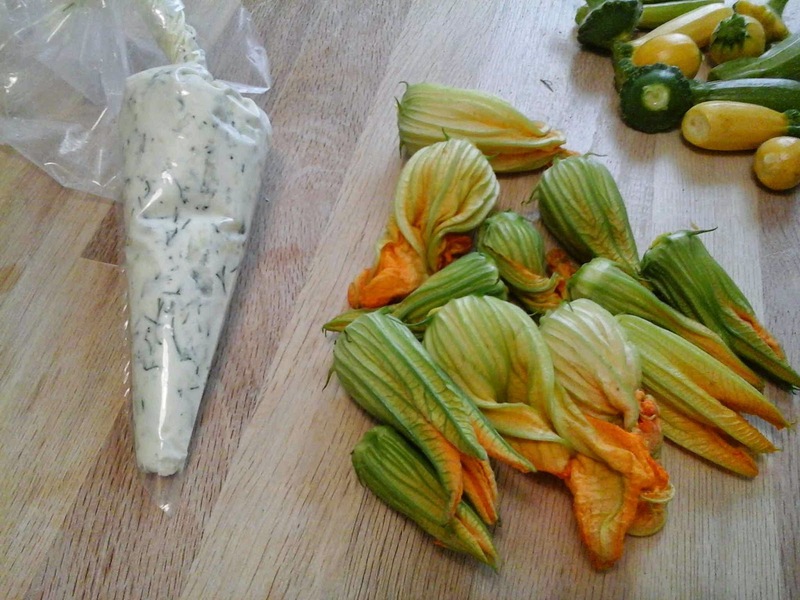 Continue with jokes while filling the flowers with ricotta mix. Pinch the stuffed flowers shut if possible. 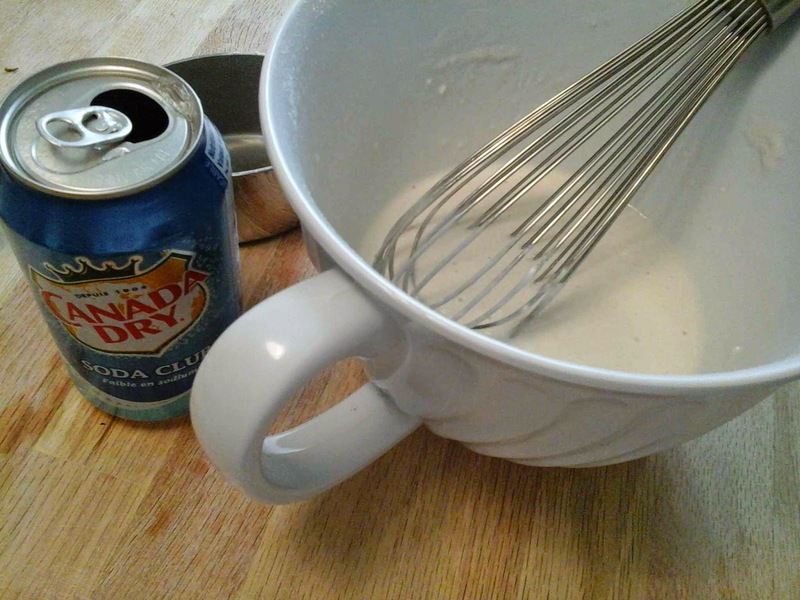 Make a batter of 1 cup flour to 1 cup sparkling water or lager beer. Now to fry! 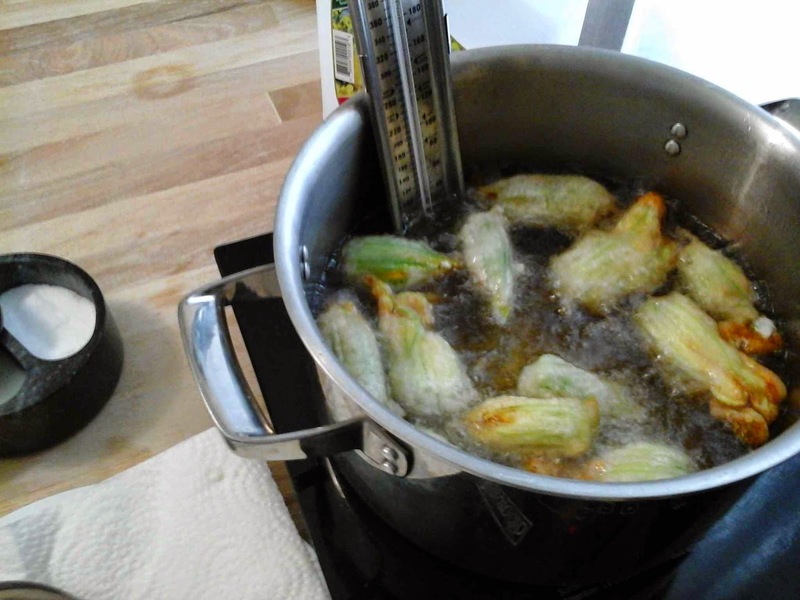 Fill a pot with vegetable or corn oil and heat up until the oil reaches 350 F on a candy/ deep fry thermometer. When the oil is ready, dip and coat flowers and gently place them in the oil. Fry until they get a nice golden brown colour all over. 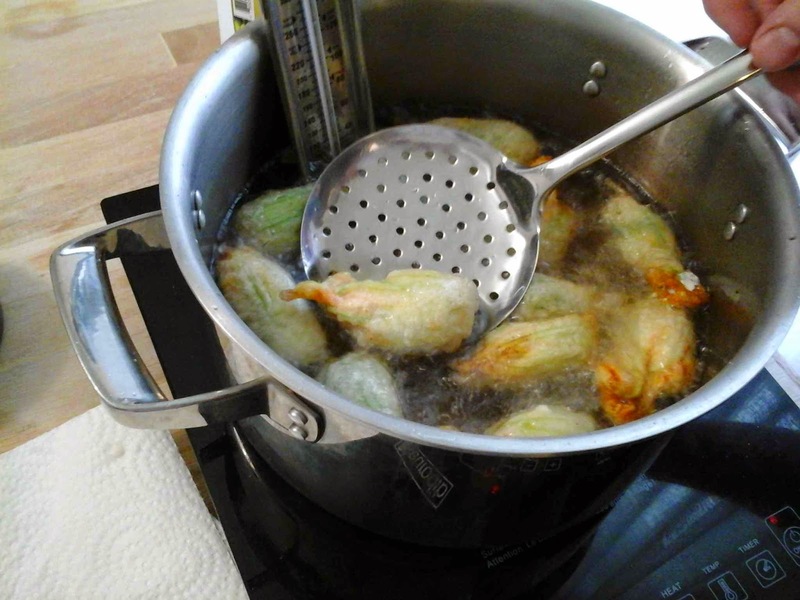 Chris tells me it is pretty hard to over cook when deep frying, so just keep an eye on them and don't worry. It only takes a matter of minutes. Scoop them out, place on a plate covered with paper towel and sprinkle with salt. 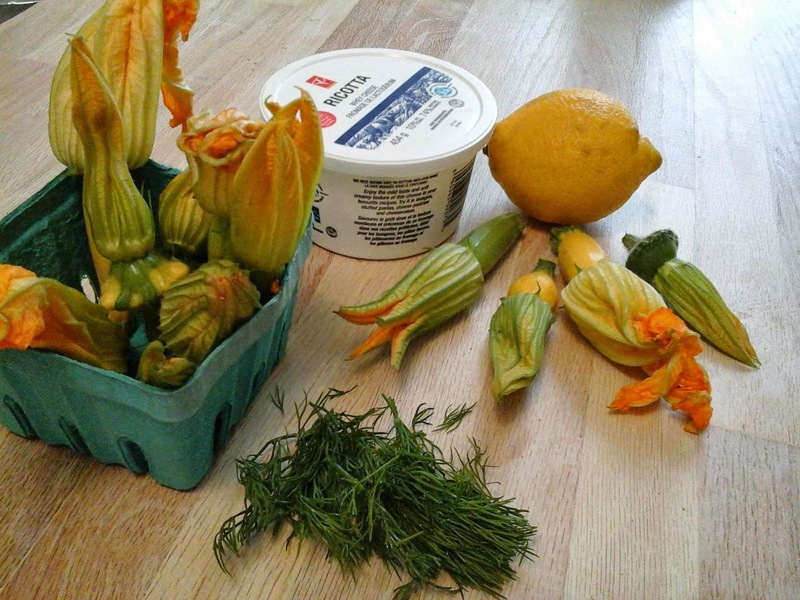 We had these with fresh veggies and sausages from the farmer's market. They turned out so so well. They are like nature's little jalapeno popper. And you can stuff them with anything you like, I chose ricotta because it is such a light cheese and mixed with a bit of lemon zest, the result was bright and not too heavy. And that was good, because of, well, you know, the deep frying. 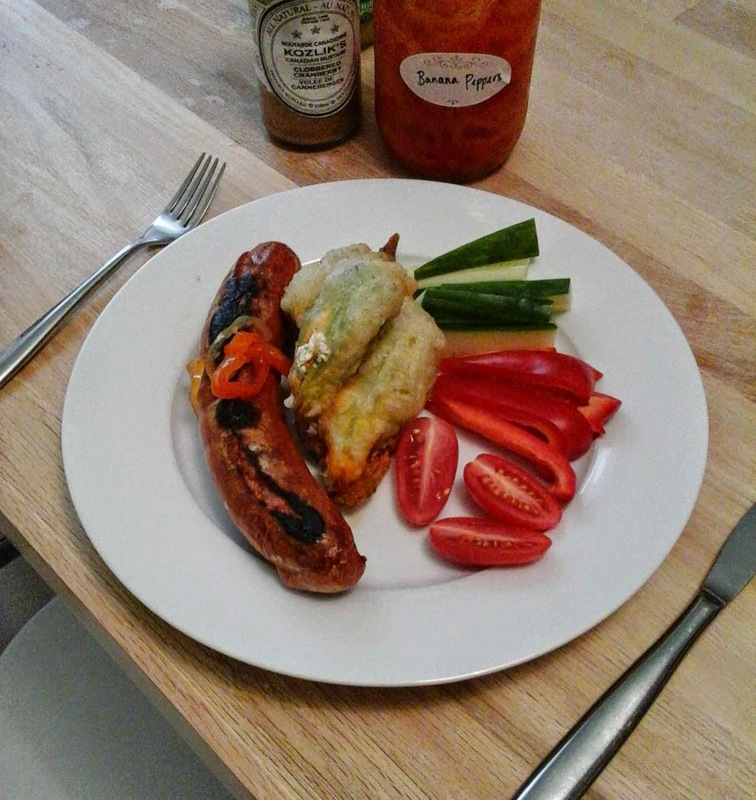 Next time I plan on trying a different filling, I want to do something spicy (more like an actual jalapeno popper). Maybe a blend of cream cheese, fresh chopped jalapenos, lime zest, chives and a bit of cream to thin the cheese. 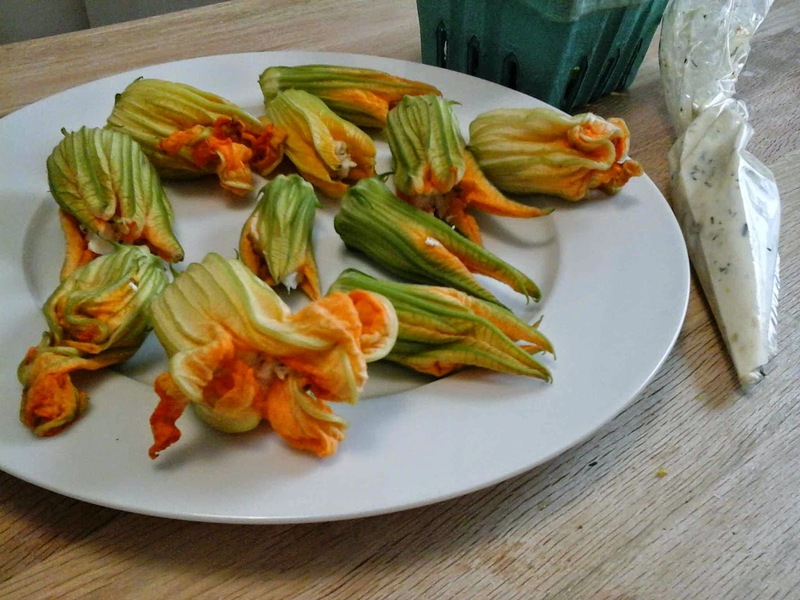 Check your local farmer's market for zucchini flowers this week!